You can see by the damage to his hoof just how long it’s taken the abscess to grow out. Why didn’t I start him on a hoof supplement earlier? Last summer and into the fall, Freedom had an abscess that lasted and lasted. He was slightly off for some time and then terribly lame. Eventually the vet drained it at his toe, and then it also traveled up through the hoof and out through his coronary band. The remains of that abscess are still with us. 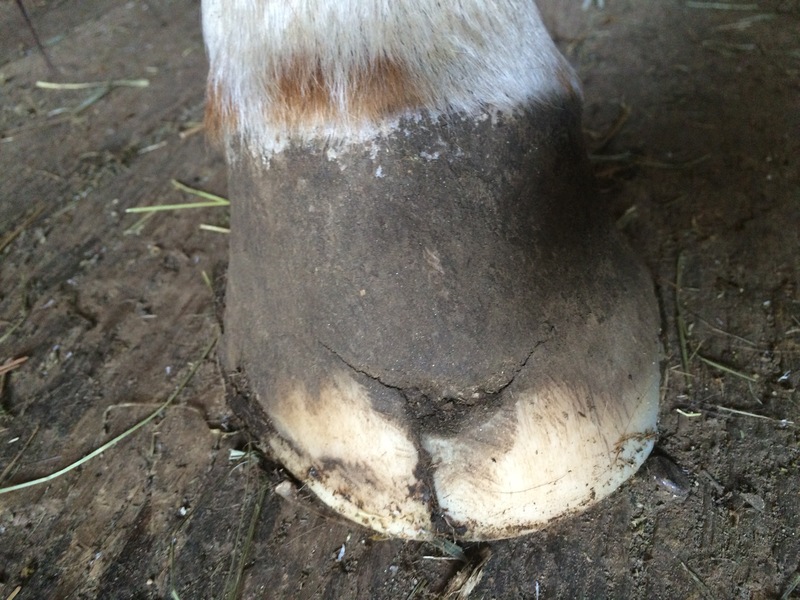 The damaged part of his hoof has grown out and now the hole, left by the abscess, is just at the point where it will threaten his hoof wall integrity and potentially make him sore. With the benefit of hind sight, I realize I should have started him on a hoof supplement last fall with the goal of accelerating this hoof growth. Silly me. He’s on one now, so I’ll just have to wait and see. My farrier and I are already discussing strategies for keeping him comfortable. Glue on shoes may be on his horizon. Have any of you dealt with the aftermath of a terrible abscess? How did you handle it? A mare at a previous barn had so many in a row of these, she completely fell behind in her training. Then, somehow, she stopped getting them. She’s one of the more stronger backed mares now. Here’s to hoping it will all grow out, take care of it self, and you’ll never have to deal with it again! Oh my, yes. I had a horse who had a chronic abscess for years that required 2 operations to fix–and that still didn’t stop him from abscessing. In the end, i had to keep it draining for months by keeping the hole open. He would get the horizontal crack, but he never got a vertical one. When he would be at this stage, I used to ride him with a bandaid on the front of his hoof to keep the dirt out. I always kept him barefoot because his hoof grew very fast and the farrier had to trim it every 4 weeks. In his stall, he wore a slipper to keep it clean. The new hoof grew a thicker wall, and that may be happening to him. I’m looking into a way to keep that crack clean. It’s particularly hard because he lives out 24/7 and it’s very muddy at this time of year. Unfortunately, there’s not much you can do after it bursts except let it grow out. I started feeding a hoof supplement to encourage growth. I’ve also been working with my farrier. I did lose a season of hunting this spring because the damage to the hoof from the abscess reached his toe. My only options were glue on shoes (not ideal for a horse that lives out 24/7) or leave him barefoot and ride him on soft ground. I’ve also used hoof boots to protect the hoof. There wasn’t enough hoof wall available to which to nail a shoe. I know that in the grand scheme of things, it’s a minor problem, but still frustrating.